The Gaza war triggered many expressions of antisemitism (i.e., statements against Jews at large) in the Arab and Muslim world, both by Arab leaders and politicians and by columnists. In their statements, they evoked antisemitic motifs taken from both traditional Islamic sources and from European ones. Cartoons featuring similar motifs were published in the Arab media. 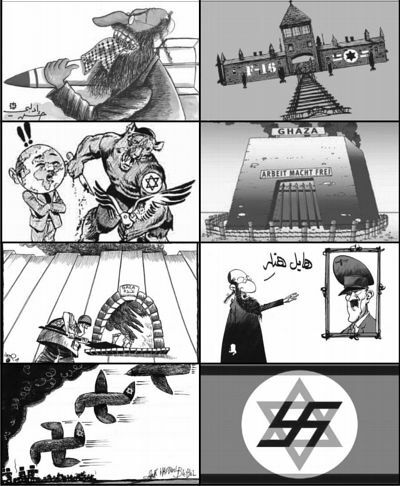 The antisemitic motifs taken from the Islamic tradition included allusion to the Jews as "the descendants of apes and pigs," as dishonest, and as domineering, while the motifs taken from the European tradition included, for example, the claim that the Jews aim to take over the world. Some of the writers also alluded to the Jewish tradition, stating that Israel’s policies are based on Jewish religious commandments. Another recurring motif was a comparison between the Gaza war and the Jewish Holocaust. The claim that Israel is as bad as, or even worse than, Nazi Germany is frequently made in the Arab press, and is meant to challenge the legitimacy of Israel's very existence. Writing in the Saudi edition of the daily Al-Hayat, Islamic researcher 'Abd Al-Rahman Al-Khatib describes the Jews as religious fanatics, and claims that their ideology – which is reflected in The Protocols of the Elders of Zion – stems from the Torah and the Talmud, and is currently being implemented in Gaza. Al-Khatib also cites traditional Muslim sources that promise the Muslims victory over the Jews. Zahi Hawwas, head of the Egyptian Antiquities Council, wrote in Al-Sharq Al-Awsat that the "Jews of Palestine" are murderous by nature: "The concept of killing women, children and elderly people ... seems to run in the blood of the Jews of Palestine. [In fact,] it seems to have become part of the false faith of this people, who is tormenting us in our [own] homeland. "The violence in Gaza, which focuses on children, may be anchored in the Talmud… [Its] objective is to realize a religious prophecy, which takes the form of a directive. [This directive is obeyed by] Jews who espouse the principles set out in the Talmud and strive to implement them. "You were merciful, oh Hitler. "Of the descendants of apes. "Of some of these wild pigs. "In Gaza, in the Golan and in Lebanon. "The Koran uses three terms to refer to the Jews: 'Jews,' 'those who are Jews,' and 'the Children of Israel'… [The second term appears six times in the Koran]. Five of these [verses describe the Jews] negatively… while the sixth is positive [but] refers only to a minority amongst them. "The first of these verses [says]: 'Some of those who are Jews change words from their context [Koran 4:46].' [The Jews indeed] distort treaties and interpret them in a way that benefits them. Of the Torah, they understand only that Allah has chosen them, while disregarding [the fact that] Allah has cursed them for disobeying the directives of the prophets, renouncing them and [even] killing some of them. [The Jews] do the same thing with the U.N. conventions, interpreting them [in a way that allows them to] perpetrate genocide, and to kill innocent women, children and elderly people..."
"The third verse refers to the prohibition against eating certain animals: 'Unto those who are Jews we forbade every animal with claws [Koran 6:146]'... But they do the opposite, bringing destruction upon animals, plants and people..."
"The fourth verse refers to [the Jews'] false claim that they, and none but they, are Allah's chosen: 'If you think that you are the favorites of Allah to the exclusion of other people, then invoke death [Koran 62:6]...' [They believe that] all others are their servants and slaves. They plunder the treasures and property of others, and control almost all the world's resources and capital. ARAB LEADERS AND DAILIES: “ ISRAEL IS WORSE THAN THE NAZIS"
In addition to describing Israel's offensive in Gaza as a war crime and a crime against humanity,(11) some Arab leaders also described it as worse than the Nazi Holocaust. "After the Nazi concentration camps were liberated, we saw photos, which are still being circulated [today], of Jews so emaciated that their ribs almost broke out through their skin... What is missing from the text that accompanies these pictures is [the fact] that the Germans also went hungry during the last year of the war, since they were besieged from every side and were under constant fire – so the Jews starved along with the Germans. (1) On modern Arab antisemitism, see MEMRI Inquiry and Analysis No. 26, "What Is Arab Antisemitism?," February 27, 2004, http://memri.org/bin/articles.-cgi?Page=archives&Area=sr&ID=SR2604; MEMRI Inquiry and Analysis No. 442 " Arab and Islamic Antisemitism," May 27, 2008, http://memri.org/bin/articles.-cgi?Page=archives&Area=ia&ID=IA44208. (2) In common Arabic usage, the word "Torah" (tawra ) refers to the Jewish Bible. (3) Al-Watan (Saudi Arabia), January 16, 2009. (4) Al-Hayat (London), January 14, 2009. (5) Al-Sharq Al-Awsat (London), January 6, 2009. (6) Al-Sharq Al-Awsat (London), January 22, 2009. (7) Al-Jarida (Kuwait), January 21, 2009. (8) The description of the Jews as apes and pigs is based on several Koranic passages, which states that Allah transformed some of the Jews into apes and pigs as punishment for desecrating the Sabbath. (Koran 5:60; 6:65; 7:176). See MEMRI Special Report No. 11, "Based on Koranic Verses, Interpretations, and Traditions, Muslim Clerics State: The Jews Are the Descendants of Apes, Pigs, And Other Animals," November 1, 2002, http://memri.org/bin/articles.cgi?Page=archives&Area=sr&ID=SR01102. (9) Al-Jazirah (Saudi Arabia), January 9, 2009. (10) Al-Jarida (Kuwait), February 2, 2009. (11) This term was used by Turkish Prime Minister Recep Tayyip Erdogan to describe the Gaza offensive. Erdogan added that Israel would be damned for murdering children. Al-Sharq Al-Awsat (London), January 28, 2009. Saudi King 'Abdallah bin 'Abd Al-'Aziz said at the January 19, 2009 social-economic conference in Kuwait, "Mass-murder has been committed in Gaza in front of the whole world by a criminal gang that has not an iota of compassion or human [feeling]." Al-Watan (Saudi Arabia), January 21, 2009. (12) Al-Ba'th (Syria), January 17, 2009. For excerpts from Assad's speech, see MEMRI Special Dispatch No. 2243, "Assad's Speech on 'Terrorist Zionist Entity' To Become Part of Syrian School Curriculum," February 13, 2009, http://www.memri.org/bin/articles.cgi?Page=archives&Area=sd&ID=SP224309. (13) Al-Sharq Al-Awsat (London), January 27, 2009. (14) Al-Ahram (Egypt), January 6, 2009. (15) Al-Gumhouriyya (Egypt), January 10, 2009. (16) Al-Watan (Algeria), January 11, 2009. (17) Al-Hayat (London), January 9, 2009. (18) Al-Hayat (London), January 20, 2009. (19) Al-Akhbar (Egypt), January 7, 2009. (20) Teshreen (Syria), March 2, 2009. (21) Al-Sahafa (Sudan), January 11, 2009. It should be noted that the Arab media does not always distinguish between Jews and Zionists. Al-Hayat columnist 'Abd Al-'Aziz Al-Sweid argued explicitly against making this distinction: "Though reason compels us to distinguish between Jews and Zionists, [there is no real cause to do so]. The latter term refers to the state of Israel and its leadership, [while the former] refers to [the Jews] who carry out influential economic, financial and media activities in the global arena, and who have not voiced any convincing opposition to [what is happening in Gaza]. In fact, they seem to be doing the opposite. They are extending media and economic support [to Israel] and creating lobbies to reinforce this support [even further]. Al-Hayat (London), January 12, 2009. Indeed, alongside the articles comparing the Jews to the Nazis, there were articles that equated Zionism with Nazism. For example, columnist Marwan Darraj wrote in the Syrian government daily Al-Thawra: "Some of the voices [condemning the Gaza offensive] displayed [a new feature] this time: they called a spade a spade. [Israel's] massacres in Gaza were referred to as a 'holocaust' and as 'Nazi and fascist crimes.' I think these are the mildest terms that European public opinion could have used. The equation of Zionism with Nazism is not groundless; it is based on, and perpetuated by, the terrorist acts that [the Zionists have been committing] for over 60 years. Hitler's fascism, as everyone knows, went to insane extremes with the [idea] of the Final Solution. The Zionist movement also endorses [this idea], including [the notion] of executing its rivals without a trial.” Al-Thawra (Syria), December 31, 2008. Columnist 'Abd Al-Rahman Al-Wabili wrote in the Saudi daily Al-Watan: "What makes the Zionist army unique in our era in terms of its unrestrained and criminal [brutality] is the cruel Zionist culture that is deeply rooted in the Zionist [psyche] and which motivates them… One of the tenets of the Zionist faith is that the Jews are the Chosen People, and that God created the universe for their sake… while the non-Jews were created in order to serve the Jews… [According to this outlook], the extermination of the Palestinians is, in its entirety, a sacred act, which comes to rectify an anomalous situation and make it correlate with the divine will…" Al-Watan (Saudi Arabia), January 2, 2009.